This was an interesting travel narrative. I don't want to say depressing, but parts of it are, after all, the title is Travel Through a Lonely Continent. 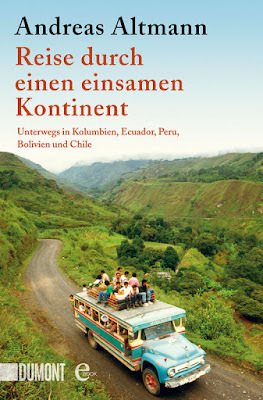 In this book, writer Andreas Altmann decides to go to South America and travel for a few months, going through Colombia, Ecuador, Peru, Bolivia, and Chile. Along the way, he meets interesting and lonely characters of various sorts. As these are the countries that I also have visited, it was interesting for me to see other people's experiences of the place. After all, I cannot say I have extensively travelled through this area. I've only checked out the Sacred Valley in Peru; the Quito area in Ecuador; spent a day in Bogota, the capital of Colombia; and was in Santiago de Chile for a week due to a conference. The time I spent was nothing compared to what the author did. So of course I didn't do more than scratch the surface. Nevertheless, I wonder if the author's method would also be my own if I decide to explore further. See, Altmann wanted to talk to weird people. He visited tenants of cult farms, German citizens incarcerated in South American prisons, sick people, creepy hotels, middle-of-nowhere towns and villages. I must say the author has an interesting and remarkable way of broadening one's horizons. It's definitely defying what almost every guidebook says one should do to travel safe. What I am worried about is that by trying to broaden one's horizons, the book is also borderline one-sided. By writing about all the lonely people he has encountered during the four months he's on the road, he also gives the impression that the continent is full of lonely and depressed folks. And I just refuse to believe that that is indeed the case. Heck, there are times in which I feel the whole Western progress is making all of us lonely individuals. I mean, you can go to the bank and execute a monetary transaction without talking to a human. There are supermarkets where you can simply go in, get what you need, and then pay at an automated counter yourself, without talking to a human. We are making things all self-sufficient and erasing human interaction left and right. Hence sometimes I actually seek these instances of human interaction: instead of grabbing a neatly packed piece of meat at the supermarket, I go to the butcher, where I actually need to talk to the person behind the counter and tell him or her what piece of meat I want. Sometimes, it's nice to feel connected, and this book makes the impression that a vast swath of the South American population are disconnected hopeless individuals who were left in the lurch. Then again, perhaps it's just the case that this is where Andreas Altmann was in his exploration of South America. I mean, he is a well-travelled individual, and he wasn't writing about his first visit to these countries. Perhaps, as a first-time visitor, you would first go to the highlights, like Machu Picchu, and only when you decide to come back do you go further and seek out places that aren't on your regular guidebook. I was like that too, for example, in my two visits to the Mexico City area. My second visit, which was earlier this year, and 7 years after my first visit, was very different from my first visit. There was no wow moment. The places I checked out were lower on the highlights list. But it nevertheless was an enjoyable visit, knowing that I have dug a little bit deeper than one typically does. Overall, like I said, this was an interesting book. Don't expect this to be a travel guide, it definitely is not. But don't expect this to provide a holistic view of the continent either. I give it 3 out of 5 stars.